Military Cemetery/Memorial / Fynwent milwrol: Canada Farm Cemetery, West-Vlaanderen. Medals Awarded / Medalau a ddyfarnwyd: British, Victory and 15 Star. Killed in action, aged 25 years. Bert’s parents were Hugh, b 1849 in Hope, and Annie (nee Hughes) b 1854 in Hope. They were married 5th February 1872 at St Cynfarchs Church in Hope. Hugh was bilingual, and all the records state that he was a coal miner. In 1881 the family lived in Alyn Bank, Hope, and in 1891 they lived in Kiln Cottages, Hope. Bert was born on 22nd April 1892, and baptised as Albert Jones at St Cynfarch’s Church on 25th February 1894. 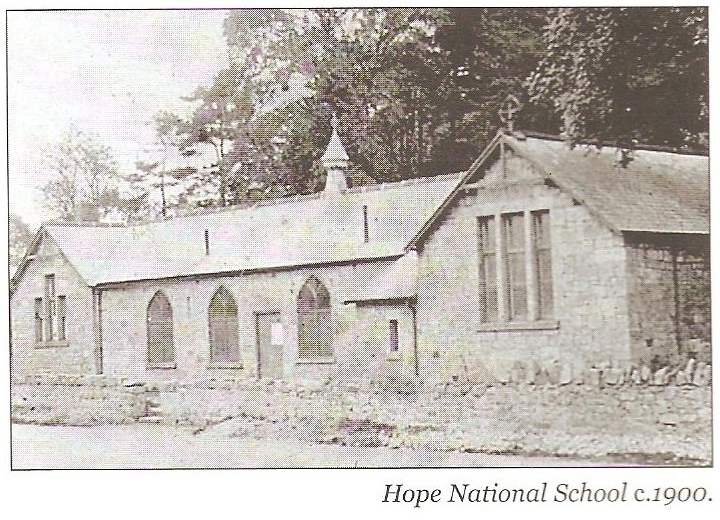 He started at Abermorddu School on 28 Nov 1900, having previously been at the Hope National School, Bridge End, Hope. By this time he was known as Bertie. By 1901 the family lived at New Houses (possibly close to the Post Office) in Hope. Annie died in September 1907 less than a year after her last baby was born. She was buried in Hope on 25th September. The family was again living at Kiln at this time. In 1911 Hugh was living in Railway Terrace, Caergwrle, with his youngest sons Bert, (a carter with a colliery company), and Henry (a brick cutter), and with his second wife Emma. The census stated that they had been married for 8 years but was probably intended to be 3 years. A marriage had been recorded in Hawarden in the first quarter of 1908 between Hugh Jones and Emma Berry. Bert’s enlistment papers and service record, other than his medal card, cannot be found. Probably they were part of the “burnt records” – the result of German bombing of the records office in London in WW2. However, Flintshire is unique in having a record card of nearly every Flintshire man who served in WW1. Bert’s card in Flintshire Record Office states that he served in the 1st Battalion of the Welsh Guards for two years, implying that he enlisted in the summer of 1915, and information from http://armyservicenumbers.blogspot.co.uk/2009/01/welsh-guards.html would suggest that as his regimental number was 1511 he would have enlisted in late May 1915. This site also states that the Welsh Guards were formed on 26th February 1915 and in three days had recruited around 600 men, many of these coming from other Guards regiments. Although some of these latter transfers were “old hands”, many were not and there are a number of ex Grenadier Guardsmen for instance, who had only joined their regiment the previous month. Nevertheless, the Welsh Guards sailed for France on 17th March 1915 whilst recruiting continued apace in Britain. 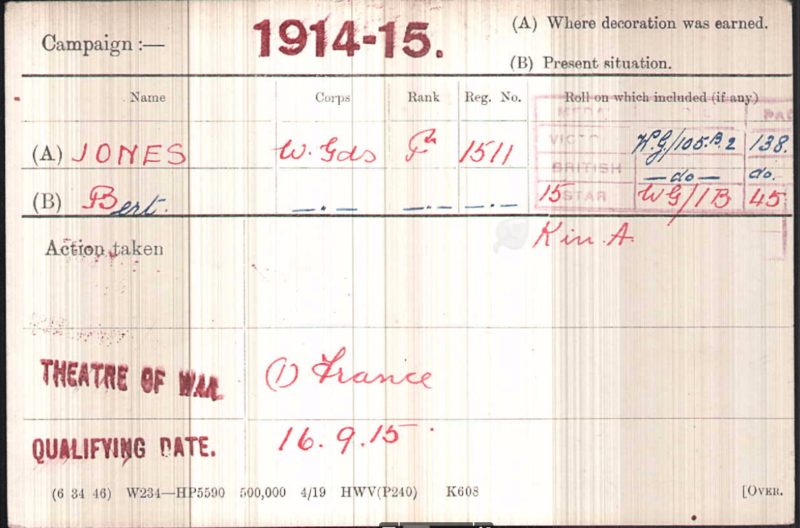 Bert’s medal card states that he entered France on 16thSeptember 1915. 1st September – CO went to see the Commanding Officer of the French Bn on the left in the morning. Brigadier General Jefferies came to see the Bn, he is commanding the Division while the Major General is on leave. 2nd September – A fine and quiet day. The brigadier General went round the entire front line by night. A brilliant moon and hardly any shelling at all. Enemy aerial activity very great, our own just the reverse. 2/Lt Fripp returned off leave to England. 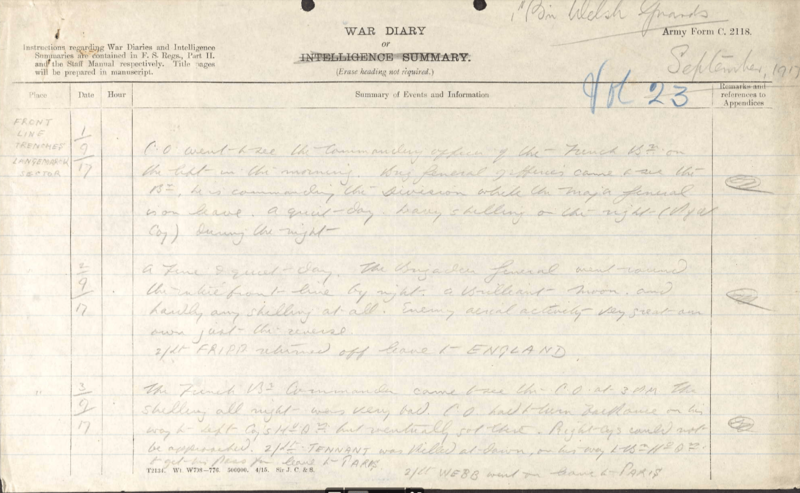 3rd September – The French Bn Commander came to see the CO at 3am. The shelling all night was very bad. The CO had to turn back once on his way to Left Coy’s Hd Qrs, but eventually got there. Right Coy’s could not be approached. 2/Lt Tennant was killed at dawn on his way to Bn Hd Qrs to get his pass for leave to Paris. 2/Lt Webb went on leave to Paris. 4th September – A lovely day and not much shelling. The Bn was relieved by the 2nd Battalion Coldstream Guards. The relief was most satisfactory and was completed by 11pm. The Bn marched to Lunaville, arriving there at 12 mn. At 2am a train arrived and took the battalion to Odank. Bert was listed as killed in action on 4th September. 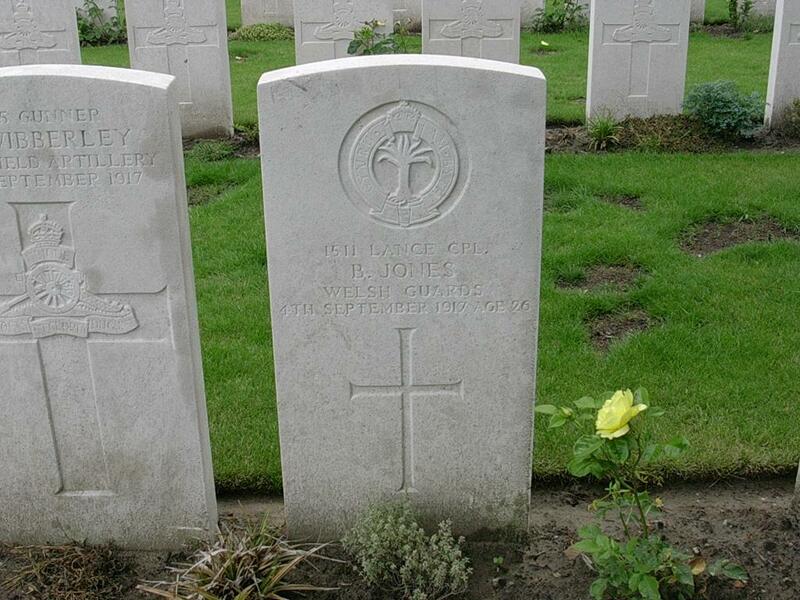 However, as he was buried at Canada Farm Cemetery it is likely that he died from wounds away from the front line. The cemetery, about 13 km from Langemarck, took its name from a farmhouse used as a dressing station during the Allied Offensive on the Ypres Salient in 1917. Most of the burials are of men who died at the dressing station between June and October 1917. There are now 907 First World War burials in the cemetery, of which 29 were Welsh Guards. Bert was awarded the British, Victory and 15 Star medals. On 12th December 1918 Bert’s father, as sole legatee, was awarded Bert’s effects (£5 9s 0d). After the war, on 31st October 1919, his father was awarded Bert’s War Gratuity of £10. Bert’s Family History can be viewed at http://person.ancestry.co.uk/tree/70118846/person/42570990229/facts. He is also commemorated on the Caergwrle memorial.